Cultural depictions of lions are known in European, African and Asian countries. The lion has been an important symbol to humans for tens of thousands of years. The earliest graphic representations feature lions as organized hunters with great strength, strategies, and skills. In later depictions of human cultural ceremonies, lions were often used symbolically and may have played significant roles in magic, as deities or close association with deities, and served as intermediaries and clan identities. The earliest historical records in Egypt present an established religious pantheon that included a lioness as one of the most powerful cultural figures, protecting the people and especially, their rulers, as well as being assigned powerful roles in nature. As human groups moved from being isolated clans and tribes to cities, kingdoms, and countries, ancient symbols retained their importance as they assumed new roles and lions have remained as popular symbols through to modern times. Depictions of lions in other cultures resembled this and all changed into more supportive roles as human figures began to be portrayed as deities. Similar imagery persisted and was retained through cultural changes, sometimes unchanged. Adoptions of lion imagery as symbols into other cultures without direct contact with lions could be very imaginative, often lacking accurate anatomical details or creating unrealistic characteristics. The association of lions with virtues and character traits was adopted in cultures where and when the religious symbolism had ceased. The earliest known cave paintings of lions were found in the Chauvet Cave and in Lascaux in France's Ardèche region and represent some of the earliest paleolithic cave art, dating to between 32,000 and 15,000 years ago. The zoomorphic Löwenmensch figurine from Hohlenstein-Stadel and the ivory carving of a lion's head from Vogelherd Cave in the Swabian Jura in southwestern Germany were carbon-dated 39,000 years old, dating from the Aurignacian culture. The earliest tomb paintings in Ancient Egypt, at Nekhen, c. 3500 BC, classified as Naqada, possibly Gerzeh, culture include images of lions, including an image of a human (or deity) flanked by two lions in an upright posture. Among ancient Egyptians, from prehistoric times through well documented records, the war goddess Sekhmet, a lioness, later depicted as woman with a lioness head, was one of their major deities. She was a sun deity as well as a fierce warrior and protector. Usually she was assigned significant roles in the natural environment. The Egyptians held that this sacred lioness was responsible for the annual flooding of the Nile, the most significant contributing factor to the success of the culture. Sometimes with regional differences in names, a lioness deity was the patron and protector of the people, the king, and the land. As the country united, a blending of those deities was assigned to Sekhmet. Similar regional lioness deities assumed minor roles in the pantheon or, when so significant in a region, continued local religious observance in their own right, such as Bast. Offspring of these deities found niches in the expanding pantheon as well. During the New Kingdom the Nubian gods Maahes (god of war and protection and the son of Bast) and Dedun (god of incense, hence luxury and wealth) were depicted as lions. Maahes was absorbed into the Egyptian pantheon, and had a temple at the city the invading Greeks called Leontopolis, "City of Lions", at the delta in Lower Egypt. His temple was attached to the major temple of his mother, Bast. Dedun was not absorbed into the Ancient Egyptian religion and remained a Nubian deity. Bast, originally depicted as a lioness and the "eye of Ra" in the delta region, was the parallel deity to Sekhmet in the southern region. Her nature gradually changed after the unification of the country and Sekhmet prevailed throughout. At that time Bast changed into the goddess of personal protection with different responsibilities, and often was depicted as a very tame lioness or a cat. She is shown to the left atop an alabaster jar that contained precious oils and lotions. The name of the stone probably bears her named because materials sacred to her usually were stored in it.. The sphinx of Ancient Egypt shows the head and shoulders of a human and the body of a lioness. The statues represents Sekhmet, who was the protector of the pharaohs. Later pharaohs were depicted as sphinxes, being thought as the offspring of the deity. In ancient Mesopotamia, the lion was regarded as a symbol of kingship. Sculptures and reliefs of the Neo-Assyrian Empire dating to the 6th and 7th centuries BC were rediscovered and excavated in the mid 19th century. Several reliefs feature lions, including the Lion Hunt of Ashurbanipal. A well-known detail of this relief is The Dying Lioness depicting a half-paralyzed lioness pierced with arrows. Other Assyrian palace reliefs from this era depict dozens of lions being hunted, originally in an Assyrian royal palace in Nineveh, located in modern-day Iraq. The Babylonian goddess Ishtar was represented driving a chariot drawn by seven lions. Ishtar's Sumerian analogue Inanna was frequently depicted standing on the backs of two lionesses. Such symbolism was appropriated by Saddam Hussein's regime in Iraq for their Lion of Babylon tank, with the technology adapted from a Russian model. Ancient depictions often described as "panthers" because of no mane, in fact, are lionesses and may be identified easily by the distinctive tip of their tails that artists familiar with their subject, correctly portrayed. Lions have been widely used in sculpture to provide a sense of majesty and awe, especially on public buildings. Lions were bold creatures and many ancient cities would have an abundance of lion sculptures to show strength in numbers as well. This usage dates back to the origin of civilization. There are lions at the entrances of cities and sacred sites from Mesopotamian cultures; notable examples include the Lion Gate of ancient Mycenae in Greece that has two lionesses flanking a column that represents a deity, and the gates in the walls of the Hittite city of Bogazköy, Turkey. The "Lion of Menecrates" is a funerary statue of a crouching lioness, found near the cenotaph of Menecrates. The lion is by a famous Corinthian sculptor of Archaic Greece, end of the seventh century BC, and is now in the Archaeological Museum of Corfu. Lion in the Iranian mythology is a symbol of courage and monarchy. He is portrayed standing beside the kings in artifacts and sitting on the graves of knights. Imperial seals were also decorated with carved lions. The lion and sun motif is based largely on astronomical configurations, and the ancient zodiacal sign of the sun in the house of Leo. Lion and sun will become a symbol of royalty in Iranian flag and coins. Goddesses Anahita sometimes have portrayed standing on a lion. Lion is also title of the fourth grade of Mithraism. Lions have been extensively used in ancient Persia as sculptures and on the walls of palaces, in fire temples, tombs, on dishes and jewellery; especially during the Achaemenid Empire. The gates were adorned with lions. Evidences are found in Persepolis, Susa, Hyrcania. Several discoveries of lion bones in Greece, the Ukraine and the Balkans have confirmed that lions lived there up to perhaps 1,000 BC, which was previously only a suspicion by some archaeologists. Thus the strong emphasis on lions in the earliest figurative Greek art, especially that of Mycenaean Greece from around 1600-1400 BC, reflected the world in which Greeks lived, rather than being based on stories from further east, as once thought. Lionesses often flanked the Gorgon, a vestige of the earliest Greek protective deity that often was featured atop temples of later eras. The western pediment from the Artemis Temple of Corfu is a well preserved example. The most notable lion of Ancient Greek mythology was the Nemean lion, killed barehanded by Heracles, who subsequently bore the pelt as an invulnerable magic cloak. This lion is also said to be represented by the constellation of Leo, and also the sign of the Zodiac. Lions are known in many cultures as the king of animals, which can be traced to the Babylonian Talmud, and to the classical book Physiologus. In his fables, the famed Greek story teller Aesop used the lion's symbolism of power and strength in The Lion and the Mouse and Lion's Share. Since classical antiquity, a Gaetulian lion in literature is a lion of fierce reputation. Gaetulia, in ancient geography, was the land of the Gaetuli, a warlike tribe of ancient Libya that appears in Virgil's Aeneid (19 BC). 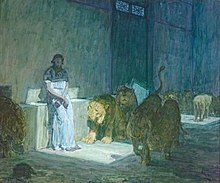 The Gaetulia lion appears in Odes of Horace (23 BC), Pliny the Elder's Natural History (77 AD), Philostratus's Life of Apollonius of Tyana (c. 215), Robert Louis Stevenson's Travels with a Donkey in the Cévennes (1879). In Socrates' model of the psyche (as described by Plato), the bestial, selfish nature of humanity is described metaphorically as a lion, the "leontomorphic principle". Several Biblical accounts document the presence of lions, and cultural perception of them in ancient Israel. The best known Biblical account featuring lions comes from the Book of Daniel (chapter 6), where Daniel is thrown into a den of lions and miraculously survives. A lesser known Biblical account features Samson who kills a lion with his bare hands, later sees bees nesting in its carcass, and poses a riddle based on this unusual incident to test the faithfulness of his fiancée (Judges 14). The prophet Amos said (Amos, 3, 8): "The lion hath roared, who will not fear? the Lord GOD hath spoken, who can but prophesy? ", i.e., when the gift of prophecy comes upon a person, he has no choice but to speak out. In 1 Peter 5:8, the Devil is compared to a roaring lion "seeking someone to devour." In Christian tradition, Mark the Evangelist, the author of the second gospel is symbolized by a lion – a figure of courage and monarchy. It also represents Jesus' Resurrection (because lions were believed to sleep with open eyes, a comparison with Christ in the tomb), and Christ as king. Some Christian legends refer to Saint Mark as "Saint Mark the Lionhearted". Legends say that he was fed to the lions and the animals refused to attack or eat him. Instead the lions slept at his feet, while he petted them. When the Romans saw this, they released him, spooked by the sight. The lion is the biblical emblem of the tribe of Judah and later the Kingdom of Judah. It is contained within Jacob's blessing to his fourth son in the penultimate chapter of the Book of Genesis, "Judah is a lion's whelp; On prey, my son have you grown. He crouches, lies down like a lion, like the king of beasts—who dare rouse him?" (Genesis 49:9). In the modern state of Israel, the lion remains the symbol of the capital city of Jerusalem, emblazoned on both the flag and coat of arms of the city. In gnostic traditions, the Demiurge is depicted as a lion-faced figure ("leontoeides"). The gnostic concept of the Demiurge is usually that of a malevolent, petty creator of the physical realm, a false deity responsible for human misery and the gross matter than traps the spiritual essence of the soul, and thus an "animal-like" nature. As a lion-headed figure, the Demiurge is associated with devouring flames, destroying the souls of humans after they die, as well as with arrogance and callousness. A lion-faced figurine is usually associated with the Mithraic mysteries. Without any known parallel in classical, Egyptian, or middle-eastern art, what this figure is meant to represent currently is unknown. Some have interpreted it to be a representation of Ahriman, of the aforementioned gnostic Demiurge, or of some similar malevolent, tyrannical entity, but it has also been interpreted as some sort of time or season deity, or even a more positive symbol of enlightenment and spiritual transcendence. A Hyrcanian Achaemenid golden cup depicting lions without manes and fully exposed ears in the sculpted heads used as handles, but manes suggested in engraving on the body. Dated first half of first millennium. Excavated at Kalardasht in Mazandaran, Iran. In a key scene of Yvain, the Knight of the Lion (French: Yvain, le Chevalier au Lion), a romance by Chrétien de Troyes, the hero is depicted as rescuing a lion from a serpent. Subsequently, the lion proves to be a loyal companion and a symbol of knightly virtue, and helps Yvain complete his altruistic ventures. In the happy end, the lion comes to dwell with Yvain and his wife Laudine at their castle. Lion sculpture at the Monument to the Unknown Soldier in Sofia, Bulgaria. In Middle Eastern culture, both Arab and Persian, the lion is regarded as the symbol of courage, bravery, royalty, and chivalry. The Middle Eastern depiction of lions are derived from earlier Mesopotamian Babylonian and Persian arts. Islamic art commonly manifests its aesthetic elements predominantly in Islamic calligraphy, floral, and geometric decorative patterns, since Islamic religious tradition discourages the depictions of humans and living creatures (animals) in its sculpture. 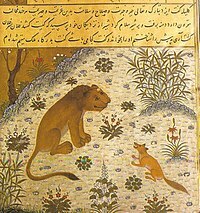 Through Persian arts miniatures and paintings, however, the depictions of humans and animals survives. In Muslim Spain period, the lion court of Alhambra palace displays the lion statues as supporters and waterspout of fountain. "Aslan" or "Arslan" (Ottoman ارسلان arslān and اصلان aṣlān) is the Turkish and Mongolian word for "lion". It was used as a title by a number of Seljuk and Ottoman rulers, including Alp Arslan and Ali Pasha, and is a Turkic name. The lion symbolism and its cultural depictions can be found in Hindu and Buddhist art of India and Southeast Asia. The lion symbolism in India was based upon Asiatic lions that once spread in Indian subcontinent as far as the Middle East. Narasimha ("man-lion"), also spelt Narasingh, Narasinga, is described as an incarnation (Avatara) of Vishnu in the Puranic texts of Hinduism. It is worshiped as "Lion God" and considered sacred by all Hindus in India. Lions are also found in Buddhist symbolism. Lion pillars erected during the reign of Emperor Ashoka show lions and the chakra emblem. The lions depicted in the Lion Capital of Ashoka inspired artists who designed the Emblem of India. Singh is an ancient Indian vedic name meaning "lion", dating more than 2,000 years ago to ancient India. It was originally only used by Rajputs, a Hindu Kshatriya or military caste in India. After the birth of the Khalsa brotherhood in 1699, the Sikhs also adopted the name "Singh" due to the wishes of Guru Gobind Singh. Along with millions of Hindu Rajputs and numerous other Hindu martial groups today, it is also used by more than 20 million Sikhs worldwide. The appellation of the name Singh was used by the Rajputs before being adopted by the Sikhs in 1699. Therefore, all "Singh"s in Indian history before 1699 are Hindu and mainly Rajputs. The lion also features as the carrier or the vehicle of Durga, the Hindu goddess of war, worshipped in and around the Bengal region. The lion is symbolic for the Sinhalese, Sri Lanka's ethnic majority; the term derived from the Indo-Aryan Sinhala, meaning the "lion people" or "people with lion blood", while a sword-wielding lion is the central figure on the modern national flag of Sri Lanka. The entrance to Sigiriya, the Lion-Rock of Sri Lanka, was through the Lion Gate, the mouth of a stone lion. The paws of the lion is one of seven World Heritage Sites in Sri Lanka. Lions were never native animals of Southeast Asia in recorded history. As the result, the depiction of lion in ancient Southeast Asian art, especially in ancient Java and Cambodia, is far from naturalistic style as depicted in Greek or Persian art counterparts, since the artist who carved the lion sculpture never saw the lion before, and all were based on perception and imagination. The cultural depictions and the reverence of lion as the noble and powerful beast in Southeast Asia was influenced by Indian culture. Statue of a pair of lions often founds in temples in Southeast Asia as the gate guardian. In Borobudur Buddhist monument Central Java, Indonesia andesite stone statues of lions guarding four main entrances of Borobudur. The thrones of Buddha and Boddhisattva found in Kalasan and Mendut buddhist temples of ancient Java depicted elephant, lion, and makara. 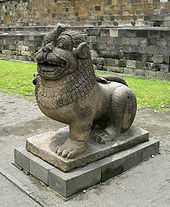 The statue of a winged lion also is found in Penataran temple East Java, as well as in Balinese temples. The Balinese winged lion often served as the guardian statue or as the pedestal of wooden column. In Cambodia statues of lions flanking the temple gate or access roads are commonly found in temples of Angkor. Bakong, a stepped pyramid Hindu temple from earlier period also displays lion statues as guardians of each stage on each of the cardinal points. Khmer lion guardian statues are commonly found in Angkor Wat, Bayon, Pre Rup and Srah Srang. Just like ancient Java, the depiction of lion in ancient Khmer art is not in naturalistic style, more like a symbolic mythical animal derived from Indian Hindu-Buddhist art. The royal emblem of Cambodia depicting a pair of guardian animals; gajasingha (hybrid of elephant and lion) and singha (lion). In Thailand, a pair of lion statues are often placed in front of temple gate as guardian. The style of Thai lion is similar to those of Cambodian, since Thailand derived many of its aesthetics and arts elements from Cambodian Khmer art. In Myanmar, the statue of lion called Chinthe guarding the stupas, pagodas, and Buddhist temples in Bagan, while pair of lions are also featured in the country's coat-of-arms. The island nation of Singapore (Singapura) derives its name from the Malay words singa (lion) and pura (city), which in turn is from the Tamil-Sanskrit சிங்க singa सिंह siṃha and पुर புர pura. According to the Malay Annals, this name was given by a fourteenth-century Sumatran Malay prince named Sang Nila Utama, who, on alighting the island after a thunderstorm, spotted an auspicious beast on shore that his chief minister identified as a lion (Asiatic lion). Recent studies of Singapore indicate that lions have never lived there, and the beast seen by Sang Nila Utama likely was a tiger. In the modern era, the lion or Merlion became the icon of Singapore due to the island's name. The Merlion also figures heavily in the official symbols of the Philippines as it was once an overseas possession of Spain; it appears on the coat-of-arms of Manila, as well as the emblems of the President, Vice-President, and its navy. The common motif of the "majestic and powerful" lion was introduced to China by Buddhist missionaries from India, somewhere in the first century AD. Lions themselves, however, are not native to China, yet appear in the art of China and the Chinese people believe that lions protect humans from evil spirits, hence the Chinese New Year lion dance to scare away demons and ghosts. Chinese guardian lions are frequently used in sculpture in traditional Chinese architecture. For instance, in the Forbidden City in Beijing, two lion statues are seen in almost every door entrance. Lions feature prominently in the Tibetan culture with a pair of Snow Lions seen on the Tibetan flag. The Snow Lions are mythical creatures that are seen as protector entities. The Snow Lion symbolizes fearlessness, unconditional cheerfulness, east, and the Earth element. It is one of the Four Dignities. It ranges over the mountains, and is commonly pictured as being white with a turquoise mane. Lions (獅子, shishi) feature prominently in many kabuki plays and other forms of Japanese legend and traditional tales. Robert III, "The Lion of Flanders"
Lala Lajpat Rai, "The Lion of Punjab"
Omar Mukhtar was called Asad aṣ-Ṣaḥrā’ (Arabic: أَسَـد الـصَّـحْـرَاء‎, "Lion of the Desert"). Mount Ecclesia: the (main) entrance arch, the Lions Arch, is considered to be a contributing structure in the Rosicrucian Fellowship Temple Historic District and is also a local landmark in Oceanside, California. 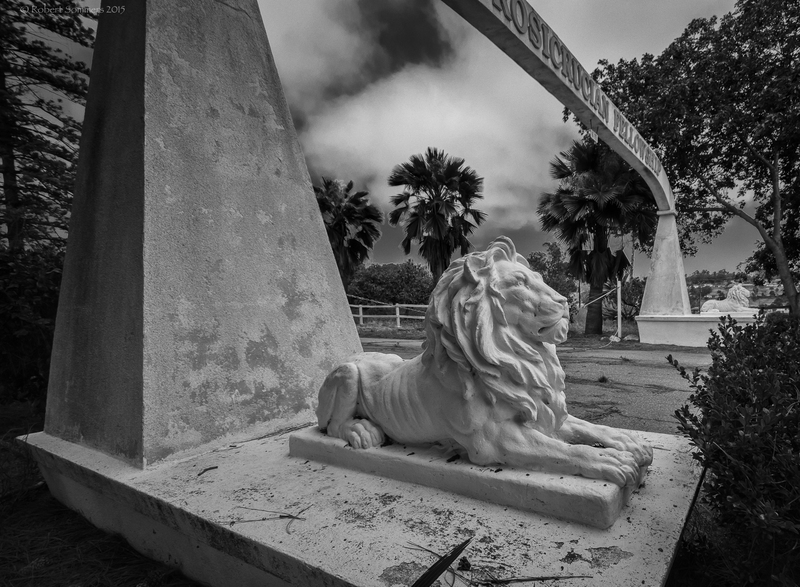 Cast concrete lions stand guard at each end of the arch. The lion holds historical significance for English heraldry and symbolism. 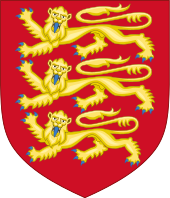 The three lions was a symbol for Richard the Lionheart, and later, for England. For many centuries the lion had been a feature of the Armorial of Plantagenet of the House of Plantagenet, and is still worn by both the England national football team and England and Wales cricket team. The lion rampant continues to be used widely today; the Royal Banner of Scotland has given rise to its use as the emblem for the Scotland national football team and Rangers and Dundee United of the Scottish Premier League, as well as English Premier League club Aston Villa; and not only sport but businesses such as the French car company Peugeot, the international beer company Lion Nathan, and Caledonian MacBrayne ferries. Arising from heraldic use, the Red Lion is also a popular pub name, with over 600 pubs bearing the name. A rarer inn name is the White Lion, derived from Edward IV or the Duke of Norfolk. Though the lion rampant appears on the Lyon coat of arms and flag, the French city's name has an unrelated derivation despite the similarity. Rampant lions are common charges in heraldry. For example, the arms of the Carter of Castle Martin family, Ireland (see Carter-Campbell of Possil) include a pair of rampant combatant lions. In the Middle Ages, when lions became a major element in heraldry, few Europeans had any chance to see actual lions. The lions were for them nearly as much legendary animals as were dragons or gryffins, which also commonly appeared on coats of arms. National currencies of three countries in Europe are named after the lion: the Bulgarian lev (Bulgarian: лев, plural: лева, левове / leva, levove), and the Moldovan and Romanian leu (/leŭ/, plural: lei /lej/) all mean "lion". A lion appears on the South African 50-rand banknotes. No less than 18 consecutive ships of the British Royal Navy bore the name HMS Lion. Also, various other navies have used the name for their vessels, as did civil shipping companies. Singapore's name is the Anglicised form of the original Sanskrit-derived Malay name Singapura, which means 'Lion City'. Malay mythology describes how the founder-prince of Singapore (then called 'Temasek') sighted a strange red and black beast with a mane when he first set ashore the island. Believing it to be a lion and a good omen (although lions were not known to exist anywhere in Southeast Asia) he renamed the island Singapura. The lion features on the Singapore national coat of arms and is also the nickname of the national football team. 'Lion City' is also a common moniker for the city-state. Using Leon (lion) as a placename started in Ancient Greece; several locations in Greece itself had the name (Greek:: Λέων) as well as a Greek colony in Sicily. Lviv, the major city of western Ukraine, is named for Prince Lev I of Galicia. Lev is a common Slavic name meaning "lion". The Latin name for Lviv is Leopolis, meaning "Lion City". The name of the city of Oran in Algeria is derived from the Berber root 'HR meaning lion, from which are also derived the names of Tahert and Souk Ahras. The name is attested in multiple Berber languages, for instance as uharu and ahra. A popular Oran legend tells that in the period around 900 BC, there were sightings of lions in the area. The two last felines were killed in a mountain near the city of Oran, which is now known as La montagne des Lions ("The Mountain of Lions"). In fact, there are two giant lion statues in front of Oran's city hall, hence the twin lions' mountain is Oran's symbol. Despite common misconception, the name of the French city of Lyon is a corruption of Lugdunum, a Latinization of Celtic for "fortress of god Lugus". The same happens with the Spanish city of León, whose name is a corruption of legio, Latin for "legion". However their coats of arms wear lions as armes parlant. In Thus Spoke Zarathustra by Friedrich Nietzsche, the lion is used as a metaphor to describe a human who rebels against old knowledge, to make a new morality possible. The morality of the overman. The lion's symbolism continues in fantasy literature. The Wonderful Wizard of Oz features the Cowardly Lion, who is particularly ashamed of his cowardice because of his cultural role as the "king of the beasts". Aslan, the "Greatest Lion" is the central figure in C.S. Lewis' Narnia series. The word aslan is Turkish for lion. The lion is also the symbol for Gryffindor house, the house of bravery, in J.K. Rowling's Harry Potter series. Lafcadio: The Lion Who Shot Back is a 1963 children's book written and illustrated by Shel Silverstein. Lions also tend to appear in several children's stories, being depicted as "the king of the jungle". In award-winning children's picture book, Charlie and Mama Kyna, Leo, the lion, befriends and journeys home with Charlie in vivid illustrations. In the A Song of Ice and Fire series by George R. R. Martin, one of the main noble houses and main antagonists of the series, the Lannisters, have a golden lion on crimson as their family symbol, and in contrast to the lion being presented as a regal, noble creature in traditional folklore, it carries the undertones of pride, corruption, and lust for power of the Lannisters. Again adhering to king of the beast role, the book The Forges of Dawn focuses on the lions (called lyons) as opposed to the other creatures of Africa. These lyons rule empires and, in the case of the antagonists, almost entire continents. They are somewhat evolved from the lions we know today. For example, lyons have more mobile dewclaws as opposed to lions who's declaws are more stationary. They also live longer and speak varied languages. The Pride of Baghdad is based on a real story of African lions that escaped from Baghdad Zoo in 2003. The live action picture Born Free (1966), based on the true story from the bestselling book of the same title, covered the story of the Kenyan lioness Elsa, and the efforts of Joy Adamson and her game-warden husband George to train Elsa for release back into the wild. The Ghost and the Darkness (1996) is a movie set in 1898. It is based on the true story of two lions in Africa that killed 130 people over a nine-month period, during the construction of a railroad bridge across the Tsavo River, in what is now Kenya. The local natives named the two lions, both males, "The Ghost" and "The Darkness". In 2005, the Kenyan lioness Kamuniak captured international attention when she adopted oryx calves, an animal species normally preyed upon by lions. She fought off predators and lion prides who attempted to eat her charges. Kamuniak's story was captured in the Animal Planet special Heart of a Lioness. Some Ford Motor Company motor vehicles of the 1960s and 1970s featured a lion as part of the car emblem, e.g., the Ford Torino, Ford LTD, Mercury Marquis, and Ford XL. A modified heraldic lion is the emblem of Australian car company Holden, an iconic Australian brand. Patience and Fortitude, the large stone lions outside the main branch of the New York Public Library, are the mascots of the New York Public Library system serving the Bronx, Manhattan, and Staten Island. The Flag of Iran bore the Lion and Sun from 1576 to 1979. In Brazil, the lion is a popular symbol of the income tax. The 1966 FIFA World Cup and the 2006 FIFA World Cup both used lions as their mascot. Turkish major football club Galatasaray SK has been symbolized by a lion since 1930s. ^ Chauvet, J.-M.; Brunel, D. E.; Hillaire, C. (1996). Dawn of Art: The Chauvet Cave. The oldest known paintings in the world. New York: Harry N. Abrams. ^ Züchner, Christian (1998). Grotte Chauvet Archaeologically Dated. International Rock Art Congress. Vila Real, Portugal. Archived from the original on 21 February 2001. Retrieved 27 August 2007. ^ Kind, C. J. (2011). "Löwenmensch, Mammut und eine Frau. Die älteste Kunst der Menschheit auf der Schwäbischen Alb und die Nachgrabungen am Hohlenstein im Lonetal". Denkmalpflege in Baden-Württemberg–Nachrichtenblatt der Landesdenkmalpflege. 40 (1): 3–8. ^ a b c d Garai, Jana (1973). The Book of Symbols. New York: Simon & Schuster. ISBN 978-0-671-21773-0. ^ Cassin, Elena (1981). "Le roi et le lion". Revue de l'histoire des religions. 298 (198–4): 355–401. doi:10.3406/rhr.1981.4828. Retrieved 2009-12-03. ^ Reade, J. (1988). Assyrian Sculpture (Second ed.). London: British Museum Press. ISBN 9780714120201. ^ "Iraqi Multi-National Force & Corps Logos, Ancient Assyro-Babylonian Images". Zinda Magazine, 2004. ^ Matthews, Kevin (2007). Lion Gate. Great Buildings Online. ^ Taheri, Sadreddin (2013). "The Archytype of Lion, in Ancient Iran, Mesopotamia & Egypt". Tehran: Honarhay-e Ziba Journal, No. 49. ^ Thomas, Nancy R. (2004). "The Early Mycenaean Lion up to Date". Charis: Essays in Honor of Sara A. Immerwahr. Princeton: Hesperia. pp. 189–191. ISBN 0876615337. ^ Graves, R (1955). "The First Labour:The Nemean Lion". Greek Myths. London: Penguin. pp. 465–469. ISBN 0-14-001026-2. ^ Virgil. "Book V, Line 352". Aeneid. ..my task to offer consolation to our friend for the downfall he did nothing to deserve." With these words he gave Salius the hide of a huge Gaetulian lion, weighed down with gilded claws and mane. ^ Horace. "Book I, Ode XXIII". Odes of Horace. You shun me, Chloe, like a fawn that is seeking its timorous mother in the pathless mountains, not without a vain dread of the breezes and the thickets: for she trembles both in her heart and knees, whether the arrival of the spring has terrified by its rustling leaves, or the green lizards have stirred the bush. But I do not follow you, like a savage tigress, or a Gaetulian lion, to tear you to pieces. Therefore, quit your mother, now that you are mature for a husband. ^ Pliny the Elder. "Book VIII – Chapter: Wonderful feats performed by lions". Natural History. It was formerly a very difficult matter to catch the lion, and it was mostly done by means of pit-falls. In the reign however, of the Emperor Claudius, accident disclosed a method which appears most disgraceful to the name of such an animal; a Gaetulian shepherd stopped a lion, that was rushing furiously upon him, by merely throwing his cloak over the animal; a circumstance which afterwards afforded an exhibition in the arena of the Circus, when the frantic fury of the animal was paralyzed in a manner almost incredible by a light covering being thrown over its head, so much so, that it was put into chains without the least resistance; we must conclude, therefore, that all its strength lies in its eyes. The circumstance renders what was done by Lysimachus less wonderful, who strangled a lion, with which he had been shut up by command of Alexander. ^ Philostratus (215). Life of Apollonius of Tyana. The extremity of Libya, which bears the name Abinna, furnishes a haunt of lions, who hunt their prey along the brows of the mountains which are to be seen rising inland, and it marches with the Gaetuli and Tingae, both of them wild Libyan tribes. ^ Robert Louis Stevenson (1879). Travels with a Donkey in the Cévennes. "Your father and mother?" cried the priest. "Very well; you will convert them in their turn when you go home." I think I see my father’s face! I would rather tackle the Gaetulian lion in his den than embark on such an enterprise against the family theologian. ^ Epstein, Marc Michael (1997). Dreams of subversion in medieval Jewish art and literature. Penn State Press. pp. 110, 121. ISBN 0-271-01605-1. Retrieved 13 September 2010. ^ "Singapore". bartleby.com. Archived from the original on 29 June 2008. Retrieved 2006-04-14. ^ "Early History". Ministry of Information, Communications and the Arts, Singapore. Archived from the original on 27 April 2006. Retrieved 14 April 2006. ^ As-Salab, A. M. (2011). Omar Al Mokhtar Lion of the Desert (The Biography of Shaikh Omar Al Mukhtar). Al-Firdous. ISBN 978-1874263647. ^ Seale, Patrick (1990). Asad: The Struggle for the Middle East. University of California Press. p. 25. ISBN 9780520069763. ^ "Bronze Lions Flank Connecticut Avenue Entrance". National Zoo. Archived from the original on 2 April 2015. Retrieved 4 March 2015. ^ Wade, W. Cecil (1898). Symbolisms of Heraldry. London: Kessinger. p. 168. ISBN 978-0-7661-4168-1. ^ "Heraldic Dictionary:Beasts". University of Notre Dame. Archived from the original on 10 June 2007. Retrieved 20 July 2007. ^ a b Dunkling L, Wright G (1994) . The Wordsworth Dictionary of Pub Names. Ware, Hertfordshire: Wordsworth Reference. ISBN 1-85326-334-6. ^ Lewis, C.S. (1950). The Lion, the Witch and the Wardrobe. HarperCollins. ISBN 0-06-023481-4. ^ Richards, D. (2006). "The Joy of Pride: Vaughan talks "Pride of Baghdad"". Comic Book Resources. Archived from the original on 23 December 2013. Retrieved 10 May 2013. ^ "TV ACRES: Advertising Mascots - Animals - Leo the MGM Lion (MGM Studios)". TV Acres. Archived from the original on 5 December 2012. Retrieved 6 August 2007. ^ The Ghost and the Darkness Were Their Names on Flickr - Photo Sharing! ^ Superbrands:An Insight into more than 80 of Australia's Superbrands - Volume II. Sydney: Stephen P. Smith. 1999. ISBN 0-9577000-0-8. ^ Shahbazi, A. Shapur (2001). "Flags". Encyclopedia Iranica. 10. Costa Mesa: Mazda. Archived from the original on 17 August 2007. Retrieved 6 August 2007. This page was last edited on 7 April 2019, at 02:36 (UTC).